Maybe this year's El Nino will cause RSS and UAH satellite temperatures to jump above that 1998 spike and "stick around for five or 10 years", but I would NOT bet on it. 2014-15 and a middling to mild El Nino and consequently nothing to bloody well see here. Have you got that Ken? For practical purposes, that article is an extended argument for the natural variability of climate. Isn't it? From the PDO chart, for instance, you can visual how the temperature rose through the 1980s and 1990s when the PDO was mostly positive, then the temperature leveled off since 1998, when the PDO has been mostly negative. 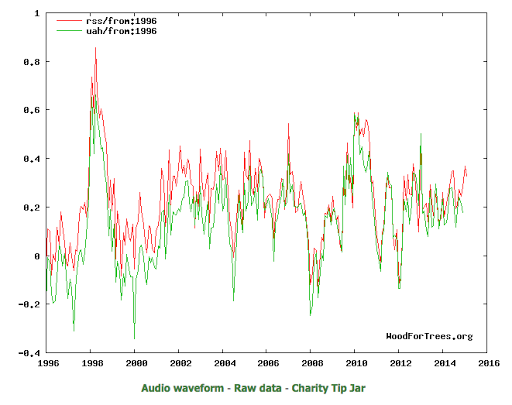 And the temperature spike in 1998 is, correctly, attributed to the Great El Nino. And the supposed coming "long-awaited jump" in temperature is also attributed to a supposed shift in the PDO to positive. It's right smack in front of their faces! Isn't it? If the EPA is really concerned about CO2 emissions; Then why don't they stop all construction in US and grow plants to absorb the CO2? Why not make all homes have sod roofs to absorb CO2 and end Global Warming? After all the CO2 emissions in the atmosphere is reversible! Pass it on!